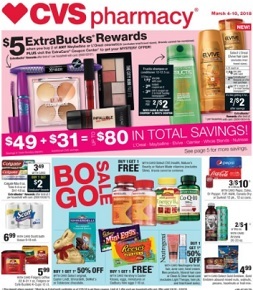 Find this week CVS best savings, valid March 31 – April 6, 2019: B1G1 50% off Select original, Easter Lindt, Ghirardelli, DeMet’s or Toblerone chocolate; B1G1 free Select CVS Health, Nature’s Bounty or Nature Made vitamins; $6.99 Scott bath tissue 9-18 roll; $5.99 Folgers coffee 22.6-31.1 oz, Folgers or Cafe Bustelo K-Cups 12 ct.; 3/$10 Pepsi, Coke, Dr Pepper, 7UP, A&W, Canada Dry or Sunkist 12 pk., 12 oz cans; 2/$1 Arizona Tea; $4.99 Select Gold Emblem, Gold Emblem abound mixed nuts, walnuts, pecans, hazelnuts or trail mix; B1G1 50% off All Duracell batteries; $.99 Kleenex regular 85 ct. or with lotion 70 ct.; B1G1 50% off Select thinkThin Nutrition, Clif, goodness KNOWS, Luna, Zone Perfect or Gold Emblem abound bar 1 ct.; 2/$8 Häagen-Dazs 14 oz, bars 3 ct. or Halo Top ice cream 16 oz. ; B1G1 50% off All Milani cosmetics; and more. Find all deals and offers from every category, in the latest CVS Weekly Ad for your local store.